In many ways, Newfoundland and Labrador heritage has been influenced by our location. One very important feature of this location is the fact that the geological boundary of North America lies offshore at the edge of the continental shelf. The shelf varies in width from about 100 km off Labrador to over 600 km off the east coast of the island of Newfoundland. It includes relatively shallow areas known as banks, and deeper areas, known as troughs, or channels. Parts of the Grand Bank portion of the continental shelf are less than 50 m deep, while some troughs are as deep as 400 m. Beyond the shelf edge, the ocean floor descends to depths beyond 2000 m.
In the shallower areas where light can reach the sea bed, photosynthesis occurs throughout the water column allowing for the growth of phytoplankton, the first link in the marine food chain. These conditions normally favour reproduction, and help explain the abundant stock of fish and marine mammals which have been important in Newfoundland and Labrador history for centuries. With the exception of the Nose and Tail of the Grand Bank and the Flemish Cap which lie further offshore and the area adjacent to St. Pierre and Miquelon, Canada's current 200-mile fisheries management zone includes most of the continental shelf. The Grand Bank lying just off the southeast coast of Newfoundland extends beyond the protection of Canada's 200 mile fisheries management zone. This zone has been in effect since 1977. The ocean over the continental shelf is cold. On an annual basis water temperatures are 7-10°C lower than at corresponding latitudes on the west coasts of North America and Europe. This is primarily because a major cold ocean current, the Labrador Current, flows southward along the east coasts of the province at a rate of about 35 km a day. Over the Grand Bank it turns southwest and a branch current flows westward along the south coast of the island and into the Gulf of St. Lawrence through the Cabot Strait. The Labrador Current also enters the Gulf through the Strait of Belle Isle. Image modified by Duleepa Wijayawardhana with permission, 1998. Courtesy of Gary E. McManus and Clifford H. Wood, Atlas of Newfoundland and Labrador (St. John's, NL: Breakwater, ©1991 MUNCL) Plate 5.2. The water of the Labrador Current is less saline (salty) than that of the main North Atlantic Ocean and thus freezes more easily. By the end of the average winter coastal Labrador inlets and the northern bays of the island are frozen. Beyond this land-fast ice, Arctic and sub-Arctic floes are carried by the current as far south as the Grand Bank. During spring and summer the ice pack retreats northward and by the end of July all coastal waters are normally ice-free. 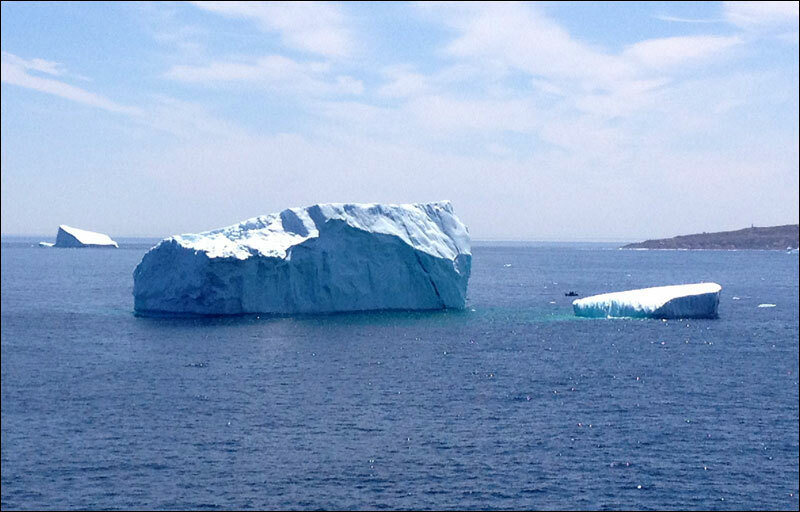 Iceberg outside the Narrows of St. John's Harbour, 2014. Iceberg-viewing has become a popular tourist attraction, but icebergs can also present a real danger to shipping and vessel movement. Reproduced by permission of Lynda Keefe. ©2014. Many icebergs ground on shallower areas of the continental shelf, and are a potential hazard to shipping and offshore oil installations. In recent years water from iceberg ice has been used commercially because of its purity and novelty, while iceberg-viewing has become an increasingly popular attraction for tourists. Reproduced by permission of Christopher Pratt. Serigraph ©1973. Courtesy of the Art Gallery of Newfoundland and Labrador, Arts and Culture Centre, St. John's, NL. The Labrador Current also has a marked moderating effect on the climate of the island and coastal Labrador, especially in summer. Cool temperatures and fog are common, in turn affecting coastal vegetation. 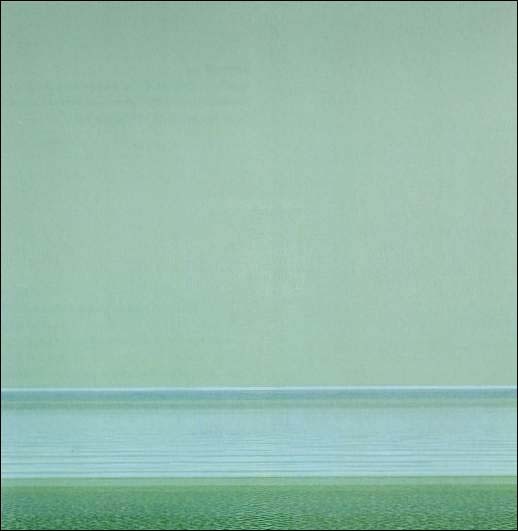 The Newfoundland artist Christopher Pratt has described the Labrador Current as "a relentless flood of molten ice, the bloodstream of our near sub-Arctic climate." For other Ocean related articles view the Natural Environment Table of Contents.